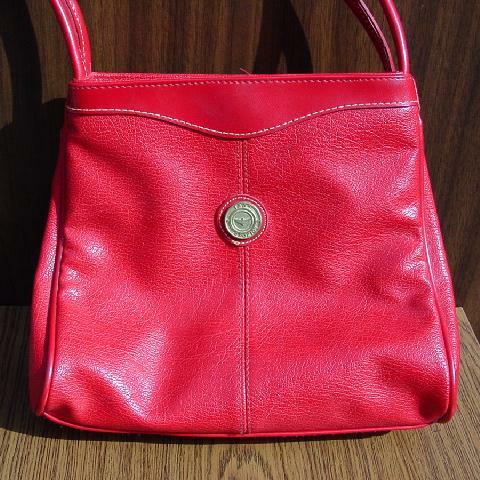 This vintage red-orange purse has two 29" long straps so you can carry it on your shoulder. There is a gold-tone ornament on the front that says 1987 Capezio. It has a back compartment with a snap closure. There are 2 other sections that also have snap closures. The back one of those two has a zipper pocket. Between those 2 sections is a roomy center section that has a center top zipper opening. This purse can definitely carry a lot. All the compartments and sections have a red fabric lining. 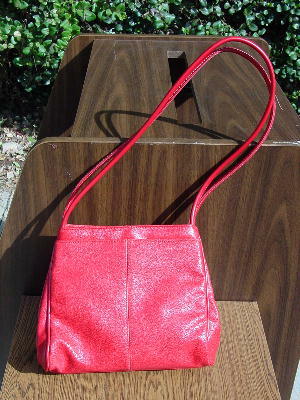 The roomy center section has a gold-tone star that is attached at the zipper.